Doctor of social sciences in the discipline of defence economics, political scientist, expert in the field of industrial defence sector. Doctor of social sciences in the discipline of defence economics, political scientist, expert in the field of industrial defence sector. Currently, lecturer at the Military University of Technology in Warsaw. In 2014-2016 worked at the Polish Armaments Group SA on matters of business development and cooperation with international institutions. 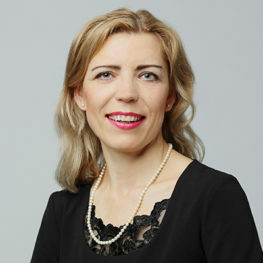 Previously she worked for 11 years in the Armaments Policy Department of the Polish Ministry of National Defence being actively engaged in the formulation of national positions in the defence industry and market area, armaments policy, and industrial cooperation. Paulina Zamelek received a MA in political science from the School for Humanities and Journalism in Poznan (Poland) in 2001. In 2002 she completed International Master of Business Administration (MBA) studies at the Warsaw University of Technology Business School (Poland). She graduated also from Dublin European Institute (Jean Monnet Centre of Excellence) at the University College Dublin (Republic of Ireland) in 2004 with a Master of Economic Science in European Economic and Public Affairs. She received PhD degree in defence economics from the National Defence Academy in Warsaw in 2013. She is interested in the defence sector integration with an emphasis on the political, economic, technological and defence matters.